Mix carrots, onion, and butter together in a 9x13-inch baking dish. Bake carrot mixture in the preheated oven until slightly tender, about 10 minutes. 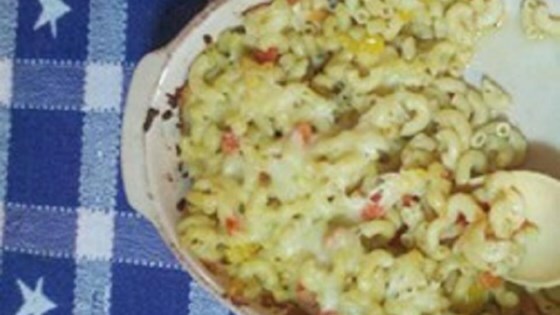 Mix macaroni, chicken, 3/4 cup mozzarella cheese, Caesar dressing, sweet bell peppers, and Parmesan cheese into carrot mixture; top with remaining mozzarella cheese. Bake in the preheated oven until casserole is heated through and cheese is melted, about 25 minutes.